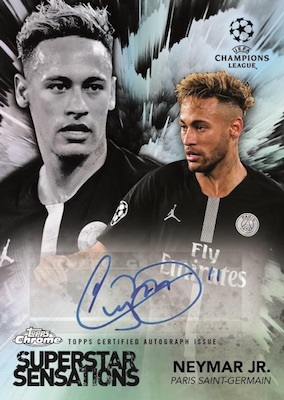 Year two of chromium UCL studs, 2018-19 Topps Chrome UEFA Champions League Soccer highlights key players and some of the biggest clubs in the world. Just like the debut product in 2017-18, every Hobby box includes one autograph and six Refractor parallels. Fans can also find similar sets via 2018-19 Topps Chrome Premier League and 2018-19 Topps Chrome Bundesliga. The core of the 2018-19 Topps Chrome UEFA Champions League checklist is the 100-card base set. Base Refractor versions average 1:3 packs and there are also low-numbered editions with some extra color. The Base Image Variation short prints feature different images from the base cards for five top players. These have one-of-one SuperFractors, as well. 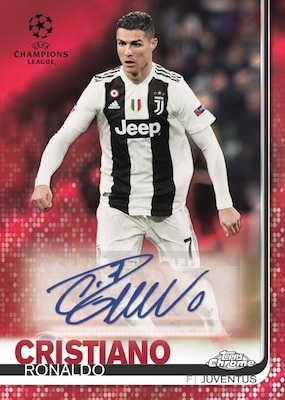 Set collectors can also build out the inserts in 2018-19 Topps Chrome UEFA Champions League. Future Stars covers the up-and-coming players and Superstar Sensations identifies a key name from each club. Getting a bit nostalgic, the all-new Champions League Debut insert revisits the first UCL appearance for notable stars. Although not as big of a Refractor rainbow as the base set, each insert has Gold (#/50), Orange (#/25), Red (#/10), and SuperFractor (1/1) parallels. Home to the top cardboard action in 2018-19 Topps Chrome UEFA Champions League Soccer, the Base Chrome Autographs set adds Blue (#/150), Green (#/99), Blue Wave (#/75), Gold (#/50), Orange (#/25), Red (#/10), Red Wave (#/10), and SuperFractor (1/1) parallels. 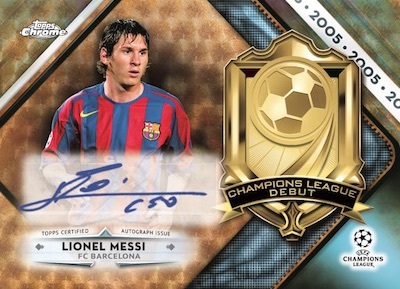 In addition, the Champions League Debut Autographs, Future Stars Autographs and Superstar Sensations Autographs cards provide signatures for select players from the main insert lineup. These are numbered and joined by a SuperFractor (1/1) parallel.